Ed. Note: We spoke about DC Taxis “eliminating outdated traditional meters” by August 31 back in May. The DC taxi commission seems to be in the process of allowing cab drivers to use tablet-based “taxi meter” apps instead of normal taxi meters. Naturally some cab drivers are using this opportunity to scam their customers. My cabbie today put a 25% tip on my bill without being asked and got agitated when I wanted to get my emailed receipt instead of a paper receipt. Here’s why – beyond the sneaky 25% tip, the distance of my ride from the Pret on M street to the Parker Flats condos at 2nd and Elm supposedly took 2.6 miles according to this “taxi meter.” The distance on google maps is 1.9 miles for this same trip, and looking closely at the email receipt it appears that a section was “tracked” as having looped around (between 6th and New Jersey) even though we took a straight route up Rhode Island Avenue. 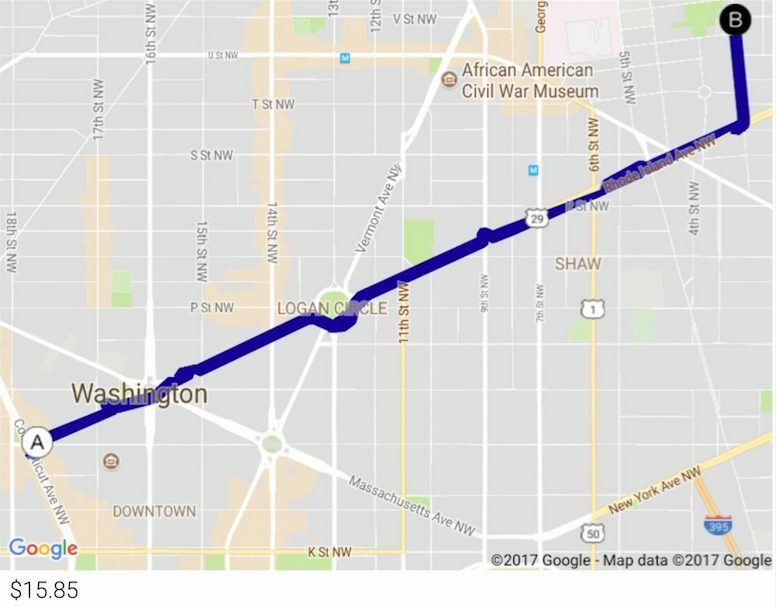 See the screenshot of the receipt – very clearly this is a 1.9 mile route, but just as clearly this app measured it to be 2.6 miles.